Experiencing Los Angeles: Super Bowl Sunday: Just Another Day at the Beach? As we approach yet another Super Bowl Sunday, it's a reminder of something Los Angeles doesn't have: a professional football team. "The NFL hasn't played here since 1994, a staggering amount of time when you consider this is the second-largest market in the country. Since then there have been stadium proposals to rebuild the Coliseum, to build new stadiums on land around Dodger Stadium, Carson, Hollywood Park, Anaheim, the Rose Bowl, near Staples Center, and, I'm pretty sure, on a barge outside L.A. Harbor. Each had its glossy presentations. Each promised to be the one. Each went down in flames." 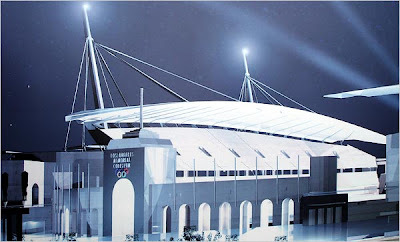 Here's an interesting re-do of the L.A. Memorial Coliseum. Another view of the same (or slightly different?) proposal at the Coliseum. 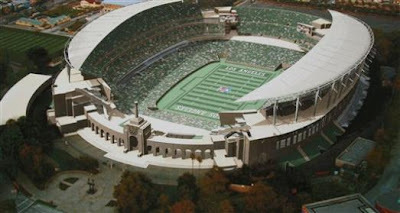 A 2003 proposal for a NFL stadium at the Rose Bowl (which never got off the ground). Billionaire Ed Roski - who brought Los Angeles the Staples Center - is currently the biggest backer of a new stadium for Los Angeles. His most current proposal is on land he owns east of Los Angeles in the City of Industry (at the 60 & 57 frwys). He's not asking anything from taxpayers; this could actually go somewhere. A couple of years ago my wife and I decided to take our kids to the beach on Super Bowl Sunday. It was a nice sunny day (ironically, the beach can be sunnier here in January than June) and we figured the beach and bike path would be empty as most people would be watching the game. Wrong. The bike path and Venice Beach Boardwalk with packed with people doing everything except watching the "big game." I'm sure there were people watching the Super Bowl somewhere in Los Angeles - but you wouldn't know it if you went to the beach. The water was chilly - but plenty of people were walking along the shore. The Santa Monica Pier was packed - doesn't anyone watch the Super Bowl in this town? Is it just me, or is Los Angeles just not a "football town"? I'm sure that could change, but at least here on the westside, I don't hear people asking "why don't we have a pro team?" (Maybe I would if I spent more time in sports bars.) Hard to believe, but greater Los Angeles use to have not one but two NFL teams at the same time: the Rams and the Raiders. The NFL just doesn't seem to be part of the DNA of Los Angeles like it is in other cities. So, what comes first? A groundswell of public interest to have a team here - or the hope that a new stadium and team will draw fans? A NFL franchise certainly doesn't need public money (in the form of a tax-payer subsidized stadium) to be here. As a Christian, I'm curious how God views what's described as "corporate welfare" - which is certainly not limited to professional football. Chuck Colson, who has developed an extensive ministry among prisoners here in the U.S. and abroad has spoken on this, including this commentary written several several years ago: http://www.breakpoint.org/listingarticle.asp?ID=3807. I like to think this is something people from a wide spectrum of religious (or non-religious) backgrounds can actually agree on. 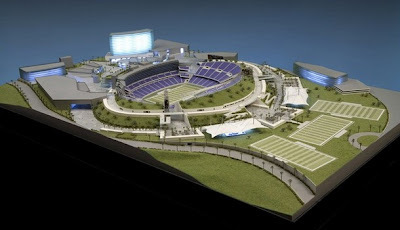 Here's hoping that a NFL team will make someday make Los Angeles their home - on their own dime. Who knows, places like the beach might be a bit less crowded on Sundays. Some background on LA as a pro football town (altho some of us might argue that there is and has been a "pro" team in So Central for decades). The Rams, when they moved to LA from Cleveland in 1946, were the first major pro sports team on the West Coast, or for that matter, west of St. Louis. So, in a way, LA was a pro football town long before MLB (1958) or NBA (1960) or NHL (1967). As far as corporate welfare is concerned (political message to follow), the current loyal opposition and former ruling party couldn't be more guilty of this sin (anyone who gives to the rich and takes from the poor, or borrows from the Chinese to do, is so guilty). And, they continue to promote "tax cuts" for business (I love Rep. Frank on this: tax cuts never built a bridge). Make no mistake, politicians from both sides are guilty here, and we and our children will be burdened with both the financial debt and the economic and infrastructure decline as a result. Man's folly. Gene out. I would love to see an NFL team here, but I don't want to be taxed only to build a stadium that has luxury boxes millionaires use. Because the NFL has had cities all over the country build them stadiums like this with taxpayer dollars, I don't see them changing soon.